The Davis-Bacon Act is a United States federal law that established the requirement that prevailing wages must be paid on public works projects. In this book, Armand J. Thieblot argues that the law was passed under false pretenses and based on flawed economic logic. Despite this, the law continues to expand in scope and increase in cost. The act is supported by a substantial bureaucracy within the Department of Labor that has resisted all efforts at substantive modernization or reform. Today, the Davis-Bacon Act is the bedrock upon which stands one of the last bastions of private unionization in the construction industry. 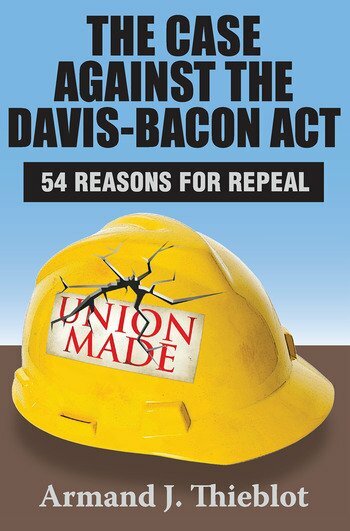 This book provides a compelling list of fifty-four separate reasons why the Davis-Bacon Act should be repealed. Thieblot deals with the history, purposes, and administrative concepts of prevailing wage laws, providing an overview of the act's administration. He covers the survey and determination process, and delves into how the act is administered. Thieblot summarizes its direct and indirect costs, evaluates counterclaims on the economic impact of Davis-Bacon, and considers compromises short of full repeal. Also included are seven appendices that provide full support for the conclusions summarized in the main text. Thieblot documents a case against Davis-Bacon that is neither judgmental nor political, but he does question whether there is compelling public interest in maintaining a federal prevailing wage law. He puts forward a list of reasons why the Davis-Bacon Act should be repealed, making a convincing case that deserves action and not just simple consideration. This work should be read by all economists, lawmakers, and government officials.